Designed for my conservative men. 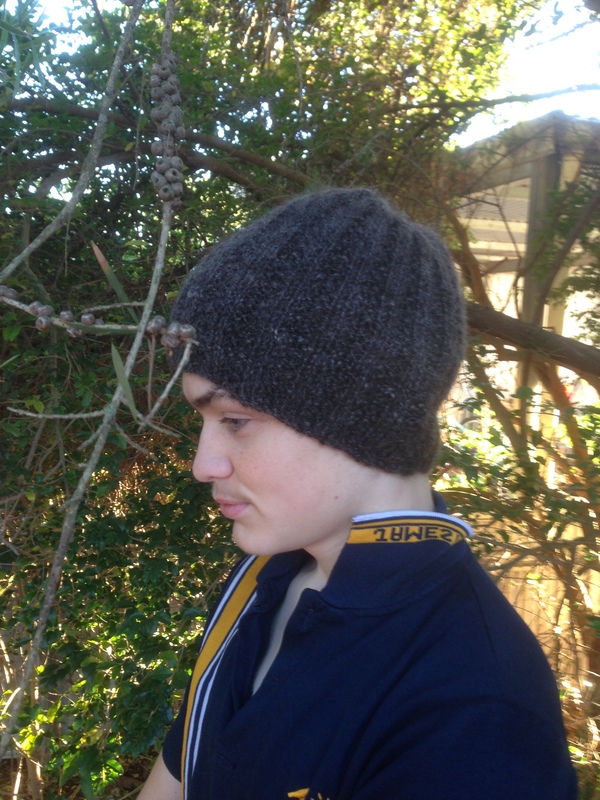 This is a blokes beanie with a little more interest in the pattern than a 2×2 rib, to keep us knitters engaged. The pattern was adapted into the round from the Mon Tricot dictionary. A lovely old book I found in an op shop years ago, it was well worn when I got it and now even more so! I’ve knitted a couple of these with my handspun. My gauge on unstretched fabric was 4 sts per inch on 4.5mm needles. Knit for gauge, by knitting a couple of inches of the hat then check to see this will fit a head. A moss stitch rib doesn’t have the same elasticity as a 2 x2 rib. There is some stretch in this hat. The width of hat is 20cm (8 inches) unstretched in the teen size. To change the size, change the number of stitches cast on, for the pattern to work the cast on number must be a multiple of 4. Increasing the length will also alter the size. 4.5mm, 40 cm circulars or your preferred needles for knitting in the round. A Stitch marker for marking beginning of round. For a smooth join I like to cast on one extra stitch and knit this together with the first stitch of the round. Instructions for round 1 are written in this way. Cast on 85 st (teen) 93st (medium) 97 (large) slip last stitch onto left needle. Place beginning of round marker on right needle. Repeat rounds 2 and 3 until hat measures 20 cm (8 inches) or length desired from cast on. Continue to ssk, until 6 sts remain. Thread yarn through remaining stitches pull to tighten and thread end to inside of hat, secure by running thread through gathered stitches then weaving in end. Wash in wool wash and lay flat to dry. Don’t skip the finishing. It evens out the stitching, giving a more professional look to your work. When selling your work you need to ensure the item survives washing!